what can they do for me? well equipped and very affordable center. I received international quality dental treatment at just 1/4rth of cost my regular dentist quoted. Well trained dentists with high level of proffesional approach. Got full mouth implants supported fixed teeth. 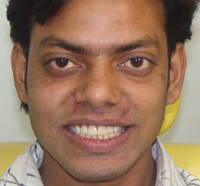 Thanks Dr. Ajay for giving me fixed teeth at very affordable cost. Got treated previously by other dentist with implants and caps with poor esthetics. Moved to Dr. Ajay, He placed the nicely looking zerconium caps. Thank you for giving back my beautiful smile. He nicely placed 6 implants with literely painless approach. saved my valuable money with quality treatment. I got implant and metal free caps done. My orthopedic brother reccomonded Dr. Ajay’s Center. Couple of my family members and relatives have been treated at the same center with high level of satisfaction. Unsatisfactorily treated by many dentists to provide quality standard teeth set. Last, reached to Dr. Ajay’ Center, Dr. Ajay performed the bone grafting procedures and fixed all my teeth with dental implant technique. I got it done in 2006 and since then I have no problem and chewing food of my preference. My teeth are fixed and I just brush them in mouth like natural teeth. Thanks for giving me beautifully looking fixed teeth again. 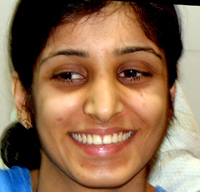 I can not disclose the treatment I received but Dr. Sunita has given me beautiful smile. I had very bad experience with my previous dentists who could not solve my problems. Lost many teeth and was not able to chew. 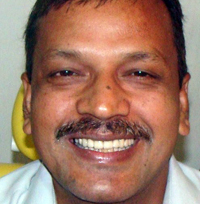 Dr. Ajay placed couple of implants and placed zirconium caps. I am completely satisfied with the treatment. 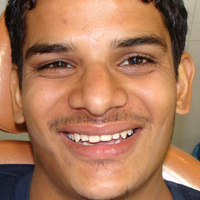 He is providing world standard dental treatment at affordable cost. 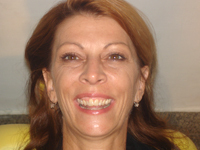 Minimal invasive dental implant and cosmetic dental procedures with ultimate outcome. 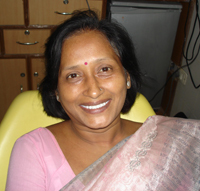 My mother referred me, who had the sinus grafting and implant done by Dr. Ajay 6 years back. 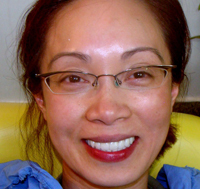 I found them competent if I compare with very popular dentists here at Toronto. I had a big gap in my front teeth. 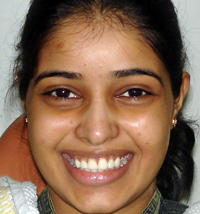 Dr. Sunita put the metal free veneers to close that gap. Very professional and ultimate cosmetic procedures. I am completely satisfied with the results. Very good treatment at competitive cost. 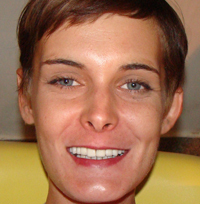 I am a airhost, had gaps in my all front teeth. 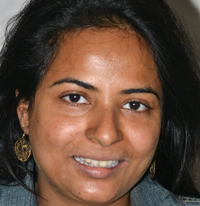 Dr. Sunita closed gaps using the ceramic veneers and now I can confidently smile. Thank you for the beautiful smile. Very good techniques at very affordable cost. I chewed lots of Pan Masala which caused the deep staining of my teeth. 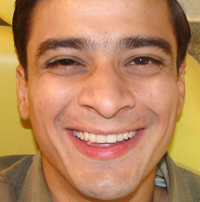 Dr. Ajay is my close friend and I am thankful to him for putting veneers to give me a beautiful smile. 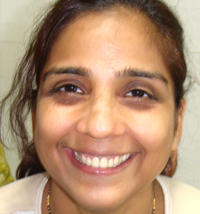 Dr. Ajay and Dr. Sunita are our dentists as well as close family friends. They have been treating our dental problems since they came in practice and I believe they are very competent dentists. I am happy to have such internationally acclaimed dentists in our city to serve our needy patients. May the god bless them? I had a severe road side accident which caused the breakdown of my front teeth. People who saw me after the accident got surprised with the results of the treatment. I am really happy to find such dentist in the need. Very professional approach, well equipped dental center. 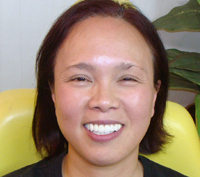 They are our family dentists and have satisfactorily treated about all our family members. 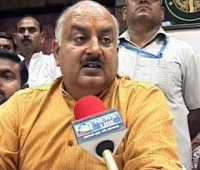 Senior IAS (Commissioner). Indian Government. Very good and advanced techniques. 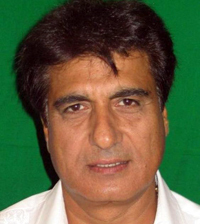 Dr. Ajay is my good friend and I saw him treating the people with professional approach and good care. I know Dr. Ajay personally. He is a highly professional dentist and good person. 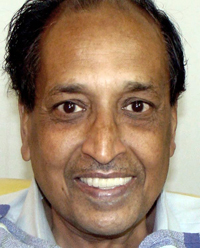 I feel happy reading his achievements at the international level in the field of dentistry. I would expect him to serve the needy people in the similar way throughout his life. 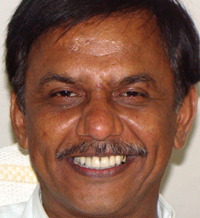 Thanks to Dr. Ajay’s center for giving me beautifully looking dentures in my budget. 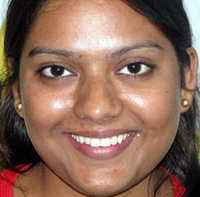 Dr. Ajay’s center is very well equipped to treat the patients with all kind of dental problems. 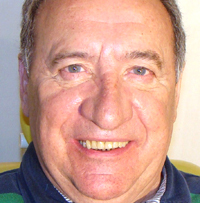 He is an excellent implant surgeon and doing well at the international level. Good to see him doing something different from the conventional dentistry. I can chew the food comfortably. 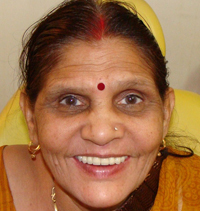 Every one suggested for the removal of remaining teeth and putting the complete denture but all were not confident about the retention of the dentures because I lost all my gum tissues because of gum infections which retain the dentures. 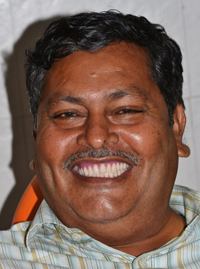 One of my close friend heard about the implant retained Overdentures and suggested me to consult Dr. Ajay. Before pulling my teeth Dr. Ajay made a new set of teeth for me and then he called me, pulled out my teeth, inserted implants and placed the denture over the implants. so I left the clinic with the new set of teeth on the same day which is very retentive and working very fine to chew the food of my choice. I did not only regain my detoriated health but also regained the high level of self confidence in my office. Thanks Dr. Ajay for getting me out of teeth sickness and depression. Outstanding treatment at very affordable cost. 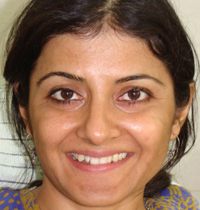 Dr. Sunita is an excellent cosmetic dentist, She treated my dental problems so nicely that I would confidently like to refer each and every one to her to get the dental treatment done. 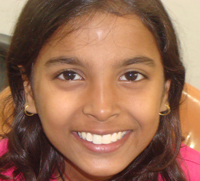 I lost my teeth at early age and had been wearing removable dentures for about 10 years. 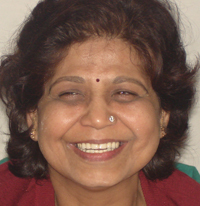 Initially my dentures were working fine but after few years my gum tissue got lost which causes loss of retention in the dentures. 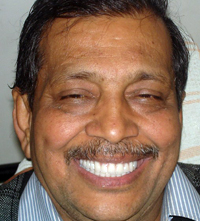 My dentist fabricated couple of new dentures but it didn’t work then he referred me to Dr. Ajay. 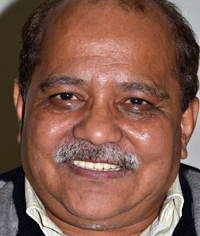 He did the grafting to regenerate new bone in the jaw inserted implants. 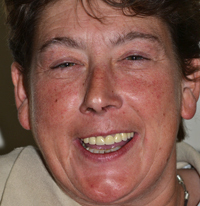 He has given me fixed teeth over the implants.Now I can chew the food of my choice and teeth look very natural. It got it done 6 years back and have no problem. I lost all my teeth because of sever gum infections. I visited many dentists in the hope of getting my all teeth implanted. No dentist could satisfy my requirement. Couple of my friends asked me to consult Dr. Ajay. Dr. Ajay inserted implants in my jaw without any much discomfort and gave me fixed teeth again which looks much better than my diseased teeth. I am very comfortable in chewing the food of my choice and looks 10 years younger. For maintenance, I need to just brush them twice in mouth like the natural teeth. I got it done 5 years back and my implanted teeth are working fine. 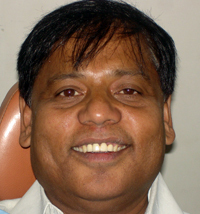 Thanks Dr. Ajay for giving me third set of teeth in my life. Dr. Ajay beautifully reconstructed my front broken teeth using metal free caps. He is a hard working and outstanding dentist. I grinded all my teeth which my dentist called sever generalized attrition. That caused the exposure of the teeth nerves so I got the root canal treatment done in several teeth but all my root canal treated teeth started broken down one after other. I consulted my endodontist and she said that she cannot put the caps because there of proper tooth left to retain the caps. After the time passed, I lost many of my teeth and started looking very old, was not able to chew because my teeth reached to the gum level to had pain in gum at chewing. Then my brother asked me to consult Dr. Ajay because he got the full mouth implantation done from him and was comfortable. 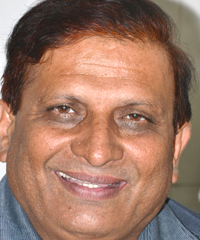 Dr. Ajay inserted implants placed ceramic caps. I am now very comfortable in chewing the food of my choice and look younger. Everybody appreciate my new teeth. Thanks Dr. Ajay and Dr. Sunita. 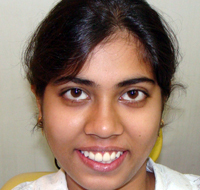 Copyright © 2009 Dr. Ajay Dental Clinic & Research Center, All rights reserved.